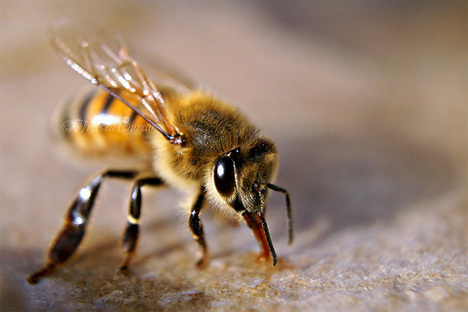 Everyone fears a bee sting, but recently researchers at Washington University have found that bee venom could have a potentially life-saving application: it can kill HIV. A toxin called melittin is found in bee venom, and somehow it is able to penetrate the little protective envelope that surrounds the HIV virus and destroy it. Ordinarily this wouldn’t be newsworthy since there are plenty of ways to kill persistent viruses – but most of those methods also destroy the surrounding normal cells. The researchers at Washington University figured out a way around this by loading melittin onto nanoparticles. The nanoparticles are equipped with “protective bumpers” that cause them to harmlessly bypass normal cells. But the HIV virus is smaller than the nanoparticles, so it comes into contact with the melittin and is destroyed. Because the method attacks the physical structure of the HIV virus, there is no way for the virus to adapt to become immune to this type of treatment. The amazing discovery could lead not only to the prevention and cure of HIV, but to the successful cures of other viruses like Hepatitis B and C.
See more in Medical Marvels or under Science. May, 2013.